Chiropractic care after a car accident is the best, drug free and natural option for the treatment of injuries resulting from automobile accidents. It is regarded as one of the most effective treatments for whiplash injuries. Chiropractic treatment can quickly reduce pain, restore normal motion of spinal joints and improve the strength and function of the spinal muscles. By using combinations of specific chiropractic adjustments, various movement therapies and a program of spinal strengthening, our patients enjoy an extremely high level of recovery. Many patients often say that, after treating with us, they end up feeling better than they did even before their accident! After an automobile injury, many people are prescribed pain medication in an attempt to “help”. Pain and anti-inflammatory medications are designed to temporarily reduce pain. They do nothing to improve the health and integrity of the muscles, and bones of the spine. What’s worse is these drugs can have serious side effects, such as nausea, dizziness, fainting, loss of muscle control, and even death. Also, by artificially blocking pain, many people will end up doing activities before they are able and cause a worsening of their injuries. 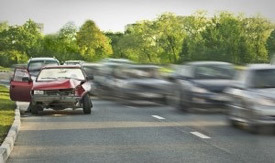 People suffering from car accidents and other traumatic incidents are forced to struggle with acute and constant pain. The reason for this is that often times you may not experience pain or inflammation right after the accident. In many cases, swelling, inflammation and pain won’t be felt for days or even weeks after an accident. These soft tissue injuries will cause your spine to lose its normal alignment and cause improper movement that, if not corrected can lead to a life time of pain and degenerative arthritis. The lower back and neck are the most commonly affected areas of your body after an automobile injury. Your spine and nerve system is a fragile structure of muscles, bones and other tissues extending from your neck to your pelvis and hips and are highly vulnerable to injury from an automobile accident.